BAD INFLUENCE has been compared to the best of Hitchcock's classic psychological thrillers. 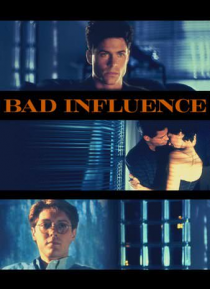 Rob Lowe stars as Alex, the mysterious drifter who manipulates himself into the drab life of Michael Boll (James Spader), an ambitious young businessman. From the heights of high finance to the depths of L.A.'s seductive underground, Alex introduces Michael to an intoxicating world of power and sensuality. … But their harmless game-playing quickly escalates into a horrifying spree of violence and betrayal in which Michael may be the next victim of Alex's evil obsession.